Our house mixed leaf lettuce salad, dressed with our lemon vinaigrette. Nutritious California grown bulgur wheat, fresh chopped parsley, tomatoes, onion, garlic, cucumber, fresh mint, lemon juice and extra virgin olive oil. 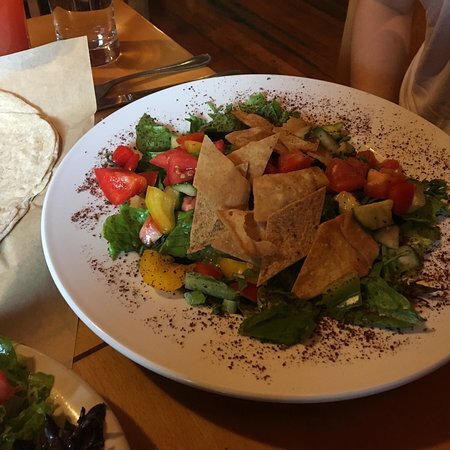 A Lebanese classic with mixed leaf lettuce, tomatoes, bell peppers, cucumbers, scallions, fresh parsley and mint. Tossed with pita croutons, imported sumac and our lemon yogurt vinaigrette. Hood river soy tempeh, mixed with an apricot curry dressing, celery, scallions, cashews and raisins. Served on a bed of lettuce with seasonal vegetables. Salad greens tossed with sundried tomatoes, Greek green olives and feta, house pickled onion, cucumber, carrot and pine nuts. Served with our creamy garlic dressing. Our popular house soup made from Egyptian lentils pureed in a savory vegan stock, finished with coconut milk. A hint of serrano peppers, roasted eggplant and Middle East spices give this tomato soup its unique flavor. 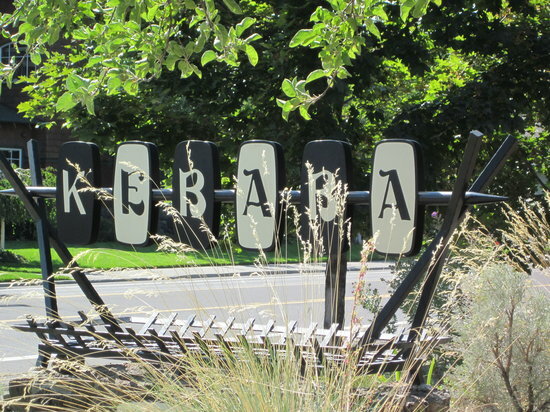 Get a cup of our freshly made soup and your choice of either kebaba or taboule salad. 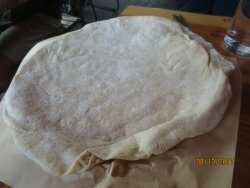 Served with a homemade pita. A blend of Northwest grown chickpeas, tahini sauce and fresh lemon juice, topped with extra virgin olive oil. Served with homemade pita. 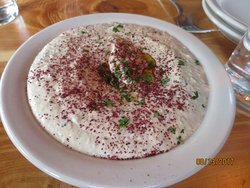 Our traditional hummous blended with roasted red peppers and our house made mild harissa spice. Served with homemade pita. Roasted eggplant mixed with tahini sauce, fresh squeezed lemon juice and garlic. Served with homemade pita. Three house prepared vegetable patties made from whole Northwest grown chickpeas, fresh parsley, onion and garlic. Served with tahini sauce. Pan seared fresh cauliflower seasoned with a zesty lemon tahini sauce, fresh parsely and imported Middle Eastern sumac. House made vegetable patties from whole Northwest garbanzos rolled in our homemade pita with tahini sauce, lettuce, tomato, cucumber and pickled onion. House roasted spiced leg of lamb, thinly sliced and wrapped in our homemade pita with lettuce, tomato, cucumber, pickled onion and our house tzatziki sauce. Spiced roasted chicken rolled in our homemade pita with house made garlic sauce, lettuce, tomato, cucumber and pickled onion. Hood river soy tempeh, celery, scallions, cashews and raisins, rolled in our homemade pita with lettuce, carrots and a curried apricot dressing. 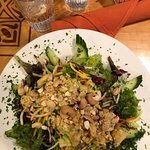 Chicken‎ breast, cashews, raisins, celery and scallions rolled in our homemade pita with lettuce and a curried apricot dressing. 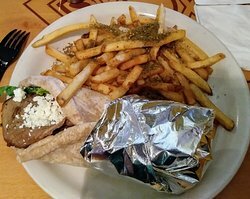 Tandoori spiced wild pacific salmon filet, grilled and wrapped in our homemade pita with lettuce, tomato, cucumber, pickled onion and our house tzatziki sauce. Panko and herb breaded wild pacific cod, golden fried and wrapped in our homemade pita with lettuce, tomato, cucumbers, pickled red cabbage and our housemade lebanese style tartar sauce. Our charbroiled blend of imperial stock ranch natural ground lamb and beef, seasoned with blended herbs and spices. Served on a roll with lettuce, cucumber, tomato and house pickled onion. We top a bowl of rice pilaf with your choice of one of the items below, and then add cucumber, tomato, carrot, house pickled onions and sauce. Special combinations of our favorites an excellent introduction to foods of the Middle East. Falafel, hummous, babaganouj, taboule, rice pilaf, tahini sauce and homemade pita. 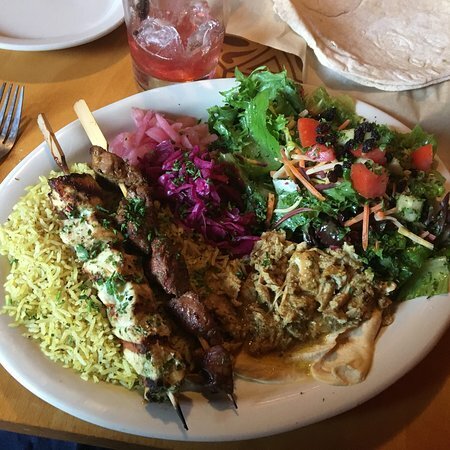 Your choice of one grilled kebab, served with hummous, babaganouj, taboule, rice pilaf, and homemade pita. 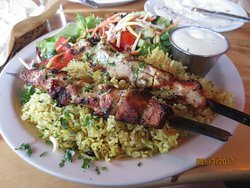 Served with rice pilaf and kebaba salad. One marinated grilled boneless chicken breast skewer, served with house made garlic sauce. 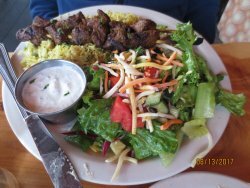 One marinated grilled lamb skewer, served with house made tzatziki sauce. One tandoori spiced grilled wild pacific salmon skewer, served with tzatziki sauce. 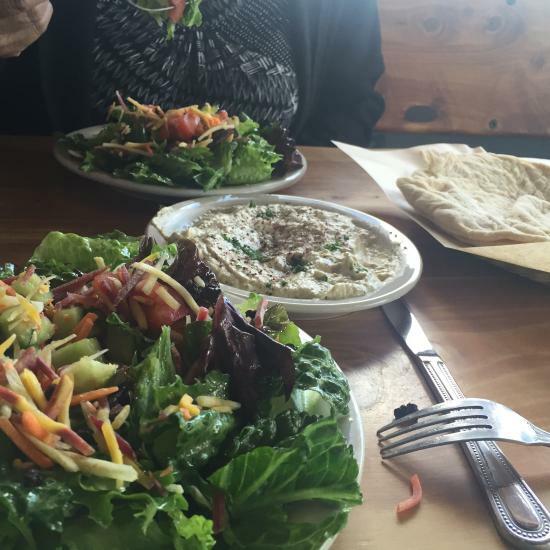 Seasoned mixed vegetables, served with house made tahini sauce.